So much yarn, so little time. : Farm shop time? I'm still working on being brave enough to go to the local organic farm (just down the lane from me) and ask them for space to sell my toys. They have diversified into butchery and sell their own meat, sausages (which are absolutely scrummy) and even make cheese, and do have a few other complementary items for sale such as local honey. So...I've been building a stock of farm-compatible knits. 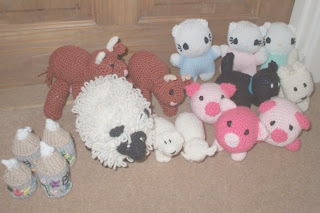 I didn't want to be in the position of them saying yes, and me replying "Ok, I'll just go and knit something!" So - pigs, cows, sheep, dogs, cats ... and for the non-Kent-dwellers, those little cylindrical things are Oast houses. 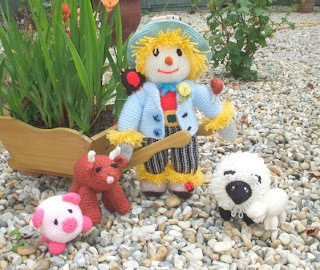 Some of the animals featured in the photos of my scarecrow (listed yesterday) cos it seemed apt! Maybe I'll ask if they'd like one of him. Now I just have to work out what to go for - consignment or wholesale? There was a really useful thread on Etsy about this dilemma, lots of great info especially from CricketsCreations. So many helpful folk on Etsy, aren't there? I thought it would be a good idea to put a different range in the farmshop (if indeed they'll take anything at all!) then there won't be a pricing issue. I can pop a card in with each toy so people can check out my other stuff if they want to. Good luck. They really are cute.